Once the Christmas decor is all put away the house seems so barren and empty. As much as I’d love to fast forward straight to balmy warm summer days filled with flip flops, starfish, and hot sand between my toes, I know we have to endure a bit more of winter. The best remedy I have found to survive the wintery blues is to make my home as cozy and warm feeling as possible. 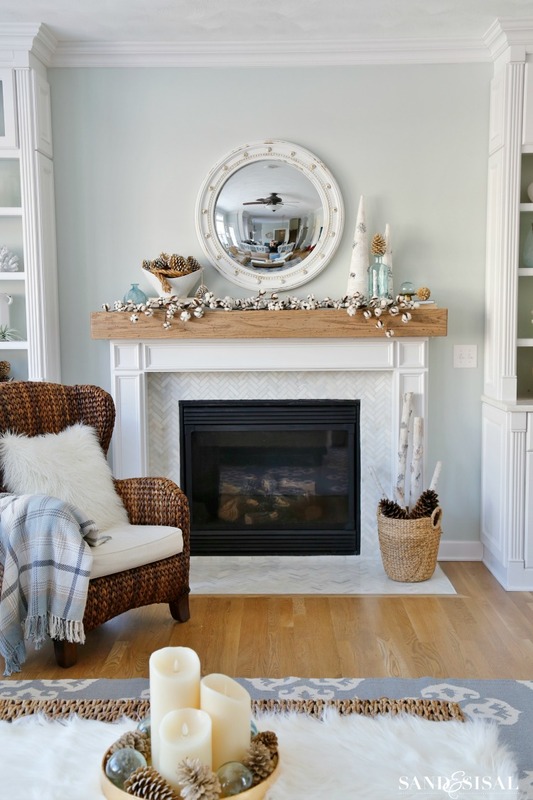 Today I’m going to show my cozy winter mantel and share a few easy winter decorating ideas (all with a bit of a coastal flair). 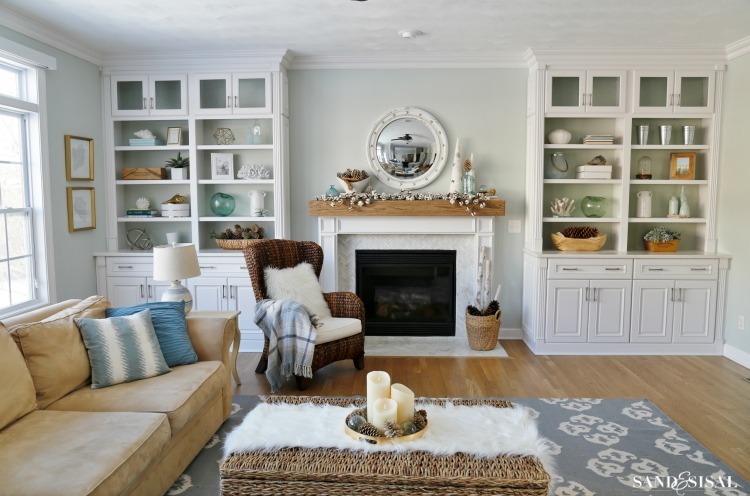 Decorating after winter is easy if you choose a wintery color palette. An abundance of snowy white and cream, soft cloudy grays, icy blue tones, with a mix of warm and dark wood tones sets the frosty winterscape mood. I filled the builtin bookshelves with a multitude of white accessories like vases, coral, picture frames, etc. The shades of blue are captured by all the sea glass frosted vases and bottles and antique glass floats. 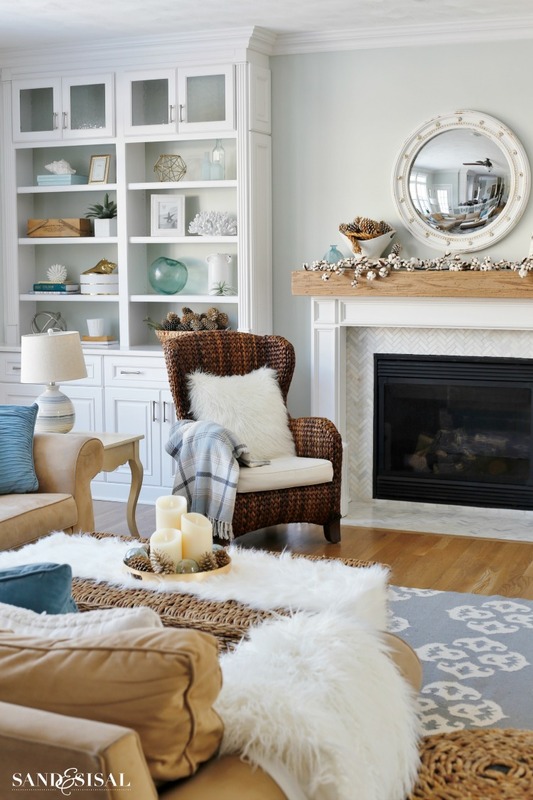 To create a cozy warm space bring in fuzzy soft textures. I can’t get enough of my crazy, shaggy, flokati-like pillows and throws. They beg for kids or your sweetheart to come curl up on the couch and snuggle close. You can find some amazing deals on throws and pillows at HomeGoods. Our couch also has several velvet, chunky sweater and soft cotton woven pillows. Choose any throw pillows that ooze comfort. If you feel like they are beckoning you to take a nap on them then that is the perfect pillow. The best way to decorate with texture is to maximize the use of natural elements in you home. 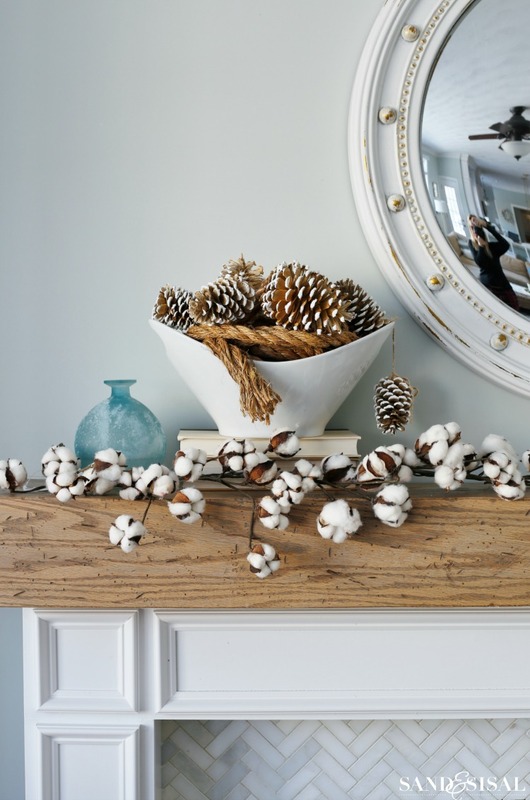 For our cozy winter mantel I pulled out the cotton boll garland. 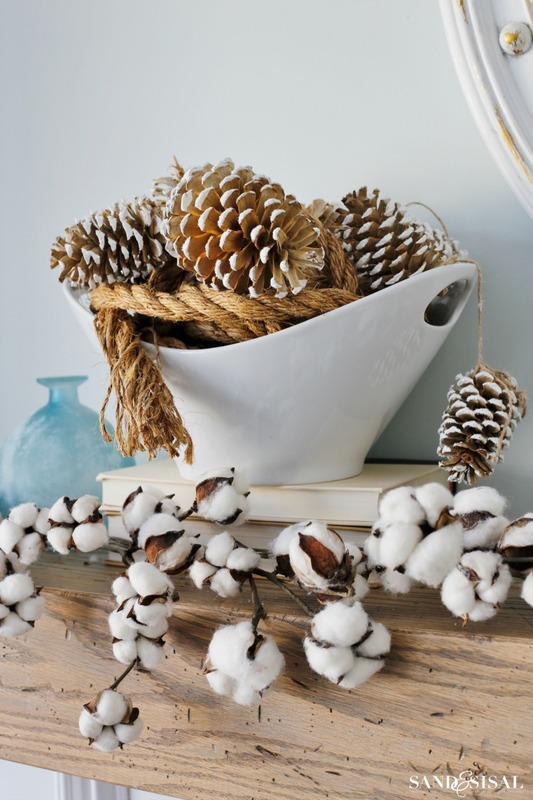 You usually see cotton boll wreaths and garlands in the fall but I think they are perfect for winter too. I didn’t have to put away all of my Christmas decorations either. I kept out the papery white birch bark cones and logs from our Christmas mantel. To add a bit of shine and icy texture, I added green-blue glass bottles and a vintage glass float. Another Christmas decoration that I didn’t put away but works perfectly for winter is the bleached, icy and sparkly, snowy pinecones. They were used during the holidays as a garland but instead I piled them into a large bowl with a swirl of nautical sisal rope. I wish the camera could capture how shimmery and icy they look! I was having far too much fun during Christmas to show you all how to make these but now I will! 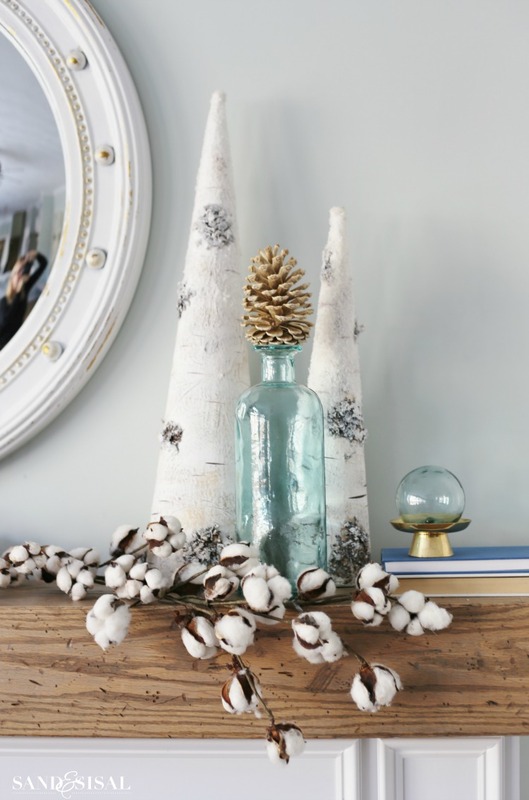 Making these pretty bleached, icy, sparkly, snowy pinecones is so easy. I started with several of my bleached pincones (click here to learn how to make beautifully bleached pinecones). Then I rolled the pinecones in a puddle of white craft paint and then immediately sprinkled this fabulous white icy glitter (affiliate link). I allowed the snowy pinecones to dry on paper. 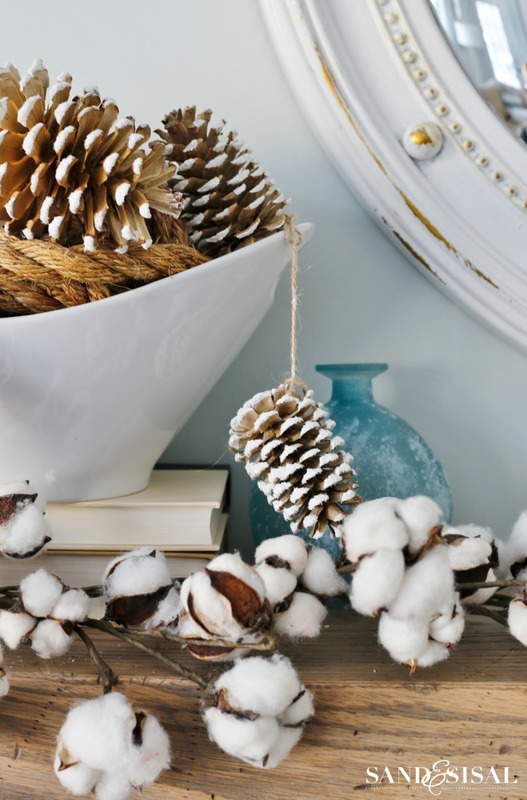 You can wrap twine around each pinecone to make a simple pinecone garland if you desire. Aren’t they fun? You will love making them! The pincone theme is repeated throughout the room. Repeating the same element throughout the room helps create a cohesive and calming look. I must tell you all, I have never seen my house look so light and bright before! We just had our first snow of the season (which is rare) and I am shocked at how the white snow outside completely changes the light in our home and translates into true colors on film without hardly any editing. LOVE!!!! How are you decorating for winter after Christmas? I’d love to hear from you! 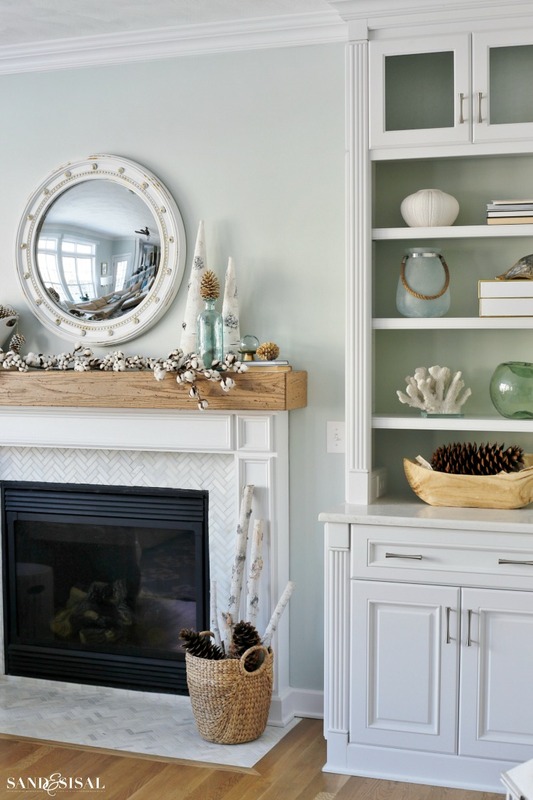 your mantel and your room are so pretty….snow or no snow. happy winter. bundle up. Love the cotton ball garland. Do you have a DIY tutorial for it or did you purchase? I really like that it could be used in fall and winter! Hi Moe! I bought mine online. You can find them on Amazon and at Hobby Lobby. I know that Hobby Lobby has them on sale right now for 50% off too! Thanks so much! I love pine cones. They are the perfect item to use from September to April for decorating. I live in Ct so I collect them in the spring. There are so many different kinds around my town. 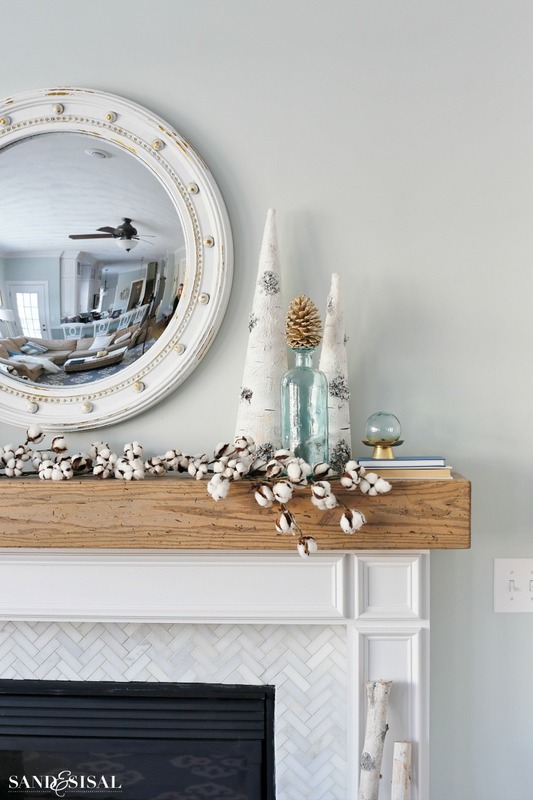 Love your mantel idea especially with the icy blue. Also love the dish with the candles pine cones and a couple glass balls. I love battery operated candles. You have so many great ideas all the time. Awww, thank you so much Shirley! You just made my day! Once I finally got all Christmas packed away, left things uncluttered for few days til could decide what I wanted to do. 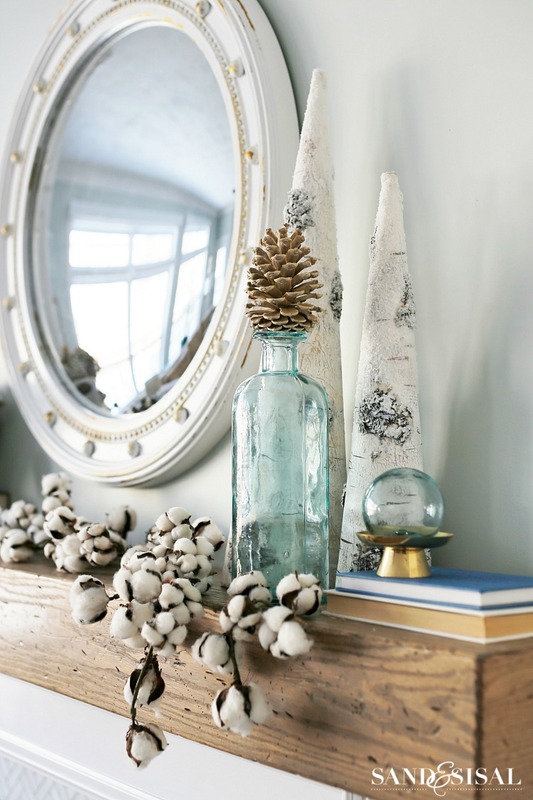 Love to use pine cones for decorating for few weeks after holidays, maybe into Feb. Leave things kinda plain to give our eyes a rest and me a rest from dusting. Our house is dusty constantly, quite annoying but after over 10 yrs. have learned to live with it, worse than southern AZ (Tucson where I lived for 20 yrs.). We live few miles west of Grand Junction, CO and of all places we’ve lived this has got to be dustiest ever. Live out in rural area. Really enjoyed this post and learned a lot after reading comments also on how to bleach pine cones. Won’t be doing that til Spring since we have ice and snow and no garage. Love all the shaggy, textured goodies as well as the pine cones. You really have a knack for decorating all of those shelves and making it look interesting yet uncluttered. The mantel blends perfectly with the whole room. Love it!